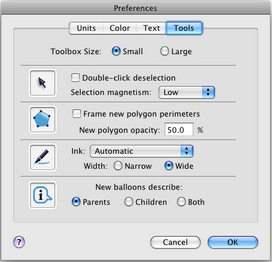 Choose Edit | Preferences and click the Tools tab to open this panel. This panel allows you control various aspects of how Sketchpad’s tools work. Toolbox Size: (Mac only) Click the appropriate radio button make the Toolbox icons larger or smaller. Arrow Tools: Choose Double-click deselection to require a double-click in empty space to deselect all objects. (This reduces the chance of deselecting all objects by mistake.) Set the Selection magnetism to Low, Medium, or High to determine how close your pointer must be to an object in order to select it. Marker Tool: You can set the ink to Brush Strokes (which become thicker and thinner in response to pressure information), to Smooth Curves (which draw more smoothly), or to Automatic (which uses Brush Strokes when pressure information is available and uses Smooth Curves when it’s not). In either case, you can set the ink to be Narrow or Wide. Information Tool: Choose the appropriate radio button to determine whether an object’s balloon shows only its parents, only its children, or both.